According to CA.gov we are living through one of the most severe droughts on record. In fact, this past January a drought state of emergency was declared. And, Downey has not escaped. I have noticed more flower beds in Downey that have the look of becoming "drought tolerant." The county of Los Angeles defines drought tolerant as a garden full of plants that can get by on rainfall alone. 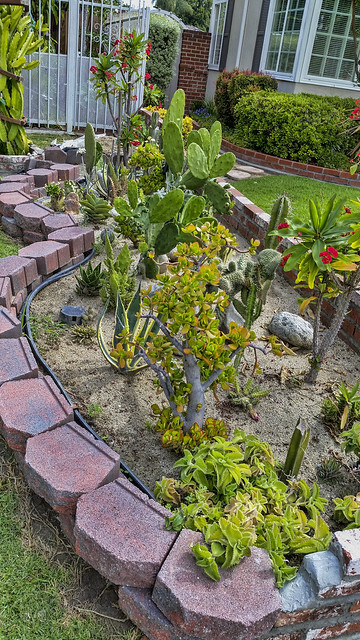 According to the LA County handbook on "The Drought Tolerant Garden," fresh water is a valuable resource and our local supply is not being replenished. We bring in most of our water from other places, and the cost of that is very expensive. We currently use at least half of our drinking water to irrigate our lawns and gardens. By making our gardens more climate appropriate, we can have beautiful, lush gardens full of flowers, herbs, fruit, even grass and meadows, at a fraction of the water cost. Today, I noticed this yard, which has a nicely done drought tolerant side section. 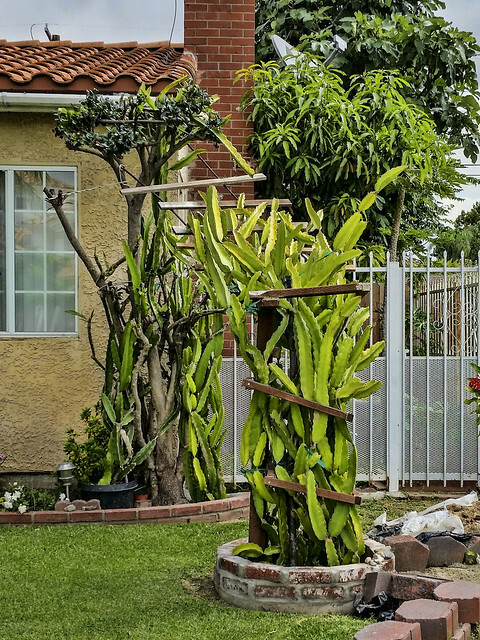 One of the things that initially drew my attention was the sort of exterior trellis that surrounded this cactus—it is very inventive. While the City of Downey encourages drought tolerant landscaping, there are some city codes you must follow. See the city site for more info. "We never know the worth of water, til the well is dry."